We specialize in the design and development of electronic products for medical sector. We have decades of experience in the field, with a team of experts and advanced tools we can customize the design and development to the needs of your organization. 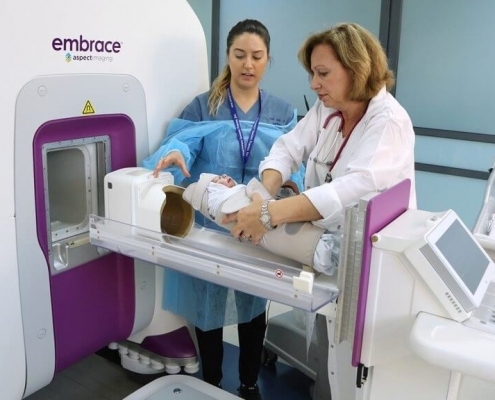 Aspect Imaging partnered with frog to realize Embrace™ , a ‘baby-centered’ Neonatal MRI designed for premature infants and the medical teams who care for them. The innovative system can be placed directly within the Neonatal Intensive Care Unit (NICU), vastly reducing the transport and preparation time normally required to scan fragile infants. Together, frog and Aspect Imaging have pioneered an entirely new category in the MRI market, one that prioritizes the needs of the most vulnerable patients to revolutionize the imaging experience. By merging science and creativity through human-centered design processes, the team designed the world’s first MRI machine specifically for safer newborn care, and have set a new standard for medical imaging products.